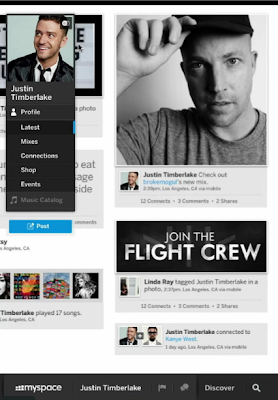 NewsGallery: THE NEWLY REBRANDED MYSPACE: CAN IT WORK THIS TIME? THE NEWLY REBRANDED MYSPACE: CAN IT WORK THIS TIME? With Justine Timberlake as its new avatar and more importantly, new investor, Myspace has been re-branded, redesigned and is trying to get a new buzz on how entirely different the once abandoned-uninhabited-Facebook-defeated social network—(having dropped to 161 most visited website on the web as of June of this year)—is now. Recoded from scratch, Myspace will focus on "how to bridge the gap for music artists and fans," says Timberlake. Hence, it's still unclear how they will appeal to the masses to use Myspace as their favorite social network over Facebook, aside from its handsomely glossy new media design. Have a watch at the promotional video (featured above) and see for yourself whether or not it may have a fighting chance against the global giant social network success that is, Facebook. There isn't an official release date for the "new Myspace" as of yet; however, there's a beta version that's slowly becoming available to artists only (mostly musical). Download The NewsGallery iPhone App, FREE for a limited time only.